We’ve been doing content marketing for almost a decade (well, nine years anyway). It wasn’t even called content marketing when we started and I’m still not entirely behind the name. We just prefer to call it advertising. However, I do acknowledge that it’s a new form of advertising made possible by the new digital world we live in. I think some people think content is just stuff you throw at your social media channels – and there are some people that do just that. However, for us, it’s about quality, not quantity. It’s about treating these new channels and customers with respect and creating work that makes a difference and drives results. Anyway, we thought it was high time that we shared our approach on how modern content marketing works. If we’re talking specifics, then content marketing’s role in the marketing funnel is really about driving consideration. And it can do that because the new media channels allow more space and time to tell a deeper story than your traditional media channels allowed. Side Track – Just in case anyone out there doesn’t understand what I mean by marketing funnel. 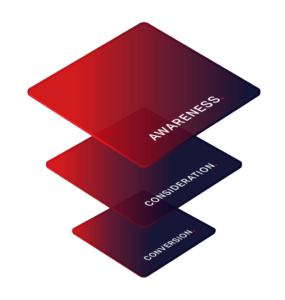 The typical marketing funnel usually has three layers; awareness, consideration and conversion. Awareness is your typical brand layer, this is where your core brand messaging is set. Consideration is about engagement, producing advertising that is helpful, inspirational, educational or entertaining. The purpose is to build a deeper connection and nurture people towards a purchase by showing them more reasons to buy. It’s about building enough depth in the relationship to get people to buy. Conversion is all about the sale. It’s about giving people the opportunity to buy and reminding them about your service at that point when they are ready to commit. What are the key ingredients to making advertising that works hard in the consideration layer? (just for clarification content can work in all layers of the funnel but it just works hardest in the middle – consideration layer.) So, what does it take to make really good content? The first job to do is to make sure that there is an established platform to work off. Otherwise, it’s kind of like building a house on quicksand. Every idea will be a good idea but without a solid idea platform, nothing will work together. Also, there is a danger that without some initial awareness your results won’t be as strong and your costs will be higher as the content will have to do both jobs. I’m not suggesting you need to spend a million dollars on a massive hero campaign but strategically, being very clear and having some work dedicated to just awareness will simply make things work better. Also, just for clarity, you can produce content that is for awareness. It might be introducing a new product or a brand but there still needs to be a clear platform developed for the content to support. It needs to be doing something, changing how people think or driving a specific engagement goal. The first thing to think about when you’re considering different approaches is why? Why are we talking to our customers and what do we want them to do as a result of the campaign. Do we want them to think about us differently or do we want them to do something, explore something, look at something in more depth? If we’re clear about the why then the rest will follow. It’s useful to think about whether we want to educate, inform or entertain people. Every piece of content should do one of these things. It needs to have a creative idea, be fun and enjoyable to use or consume. It should provoke engagement. Once we know what we’re making then let’s make something great. Now I don’t mean expensive – you can do some things simply, you can even make some stuff on your phone, just check what’s right for your brand. If you want to be seen as cheap or a value brand that could be totally appropriate, but if you want to be a premium brand, a thought leader or the number one or two in your category you might want to have a more premium feel. So don’t just make lots of stuff, great content needs to be great, take the time and craft something good. It should be emotional, original and authentic. Daniel Kahneman in his book, Thinking Fast and Slow, introduced us to the power of emotion and the importance of winning with emotion first. The premise is that we almost automatically buy brands that we want and the strongest way we connect with brands is through emotion. Of course, the product needs to be good but we use this rational thinking to justify what our emotional brain is wanting to do. Hand in hand with this is the idea of authenticity. It’s hard to form a connection with your customers through stock photography. If you can invest in your own original content, there are plenty of ways to get good photography done. If you’re not comfortable doing it yourself, you can get a photographer and commission them to do a day shoot and capture lots of images that you can use for the season. You just need to think through all the different shots you need and plan it out. Doing it this way can help you create a library of images you can use not only for your advertising but for across your business as well. If you’re struggling to think about what to create, start by thinking about all the questions you’re asked about your products and services. Talk to your sales team, make a list and then create content that answers those questions. You could also look at searches that people are making in your space. You may already have this keyword research if you have done some search engine optimisation (SEO) work. The last place to look would be your analytics account. If you have an internal site search on your website you could look at the things people are searching for to create content. The objective here is to position you as an expert in your field, give your opinion, give people the information they need to help them make decisions, help them do some things themselves and be generous. Ensure you optimise your content/copy with those search terms. Once your piece is finished make sure you give it the best opportunity to be found. Talk to your SEO team and make sure you have a keyword objective for your content, spend a little bit of time making sure the metadata is crafted and that you actually use that keyword two or three times in the body copy. If your content is a video or photography there is usually a description on the video hosting/YouTube page. Ensure for photography, you set the Alt tag for each image too. That way your images might come up when someone is searching for images as well (and it’s also good practice in terms of providing a better more accessible experience – the alt tags are there to help visitors with low vision). Copy, video, tools, games and promotions, variety is the spice of life, so mix things up. At the same time focus on what is the right form for your idea. Video is really effective at creating an emotional message and communicating key information. However, sometimes nothing beats a well-written article to make the point. In addition, don’t forget about creating tools to help your customers too, maybe calculators or AR tools that allow them to find or visualise your product. And lastly have some fun, games or an engaging competition can be great ways to build your audience, creating databases that you can reconnect with later. Make sure you get that content out there. Remember it’s actually advertising and specifically, it’s all about doing the job in that conversion layer. So, think about your audience and what media they consume. Then use the appropriate channels to get it out there, highlight it on your website, promote it across your social channels and send it out in your emails – on top of that use advertising to promote it as well. You can also use remarketing to get it in front of people that are already aware of your business. At the end of the day, it’s all about driving people through that funnel. Lastly, once you get everything out there – track and measure everything. Make sure you understand what’s working and what’s not. This will give you insights in terms of what is engaging your audience, what they are actually interested in and what was a bit blah. So that’s it, nine things for you to think about when you’re creating engaging advertising focused on driving consideration. Think about what you want to achieve, develop a strategy, have a clear purpose and create something great, something useful. If you can do that then you’ve created more than just a piece of content, you’ve made good things happen. A YoungShand creative content series, exploring the work of Hannah Jensen. What does great website design look like today? Since our start nine years ago, what’s changed? And what are we focusing on today?